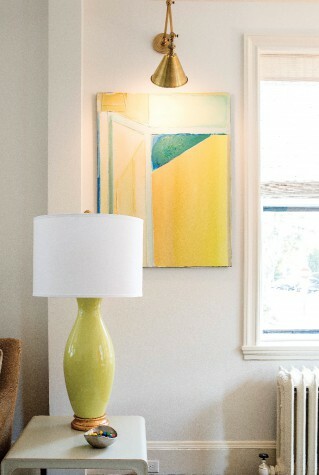 In the dining room, a colorful abstract by Erik Knight called A Painter’s Space is one of two paintings that set the tone for the interior design by Linda Banks of Simply Home and Banks Design Associates. Banks added a custom-designed wainscoting to break the height of the walls and add architectural interest. 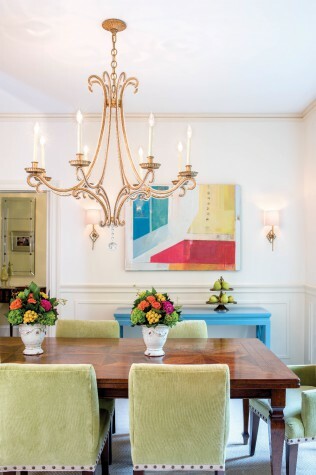 A handmade Italian table, chandelier, and wall sconces add some elegance, while the green chairs and blue console bring in some playful pops of color. Every wall in the living room is adorned with art. To the far right is one of the two Erik Knight paintings that Banks used as inspiration for the interior design. The rest is Maine art: over the sofa is Carrie Lonsdale’s Six Ticket Ride from Portland Art Gallery, in the corner to the right of the bay window is Liz Hoag’s Red Maples from Elizabeth Moss Galleries, and above the fireplace hangs Jean Jack’s Ten Acres from Portland Art Gallery. 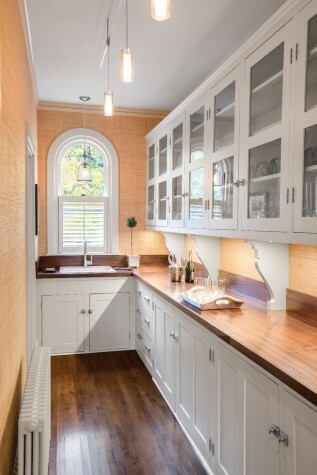 A butler’s pantry original to the house features African mahogany countertops. Summer Islands by Julie Freund hangs in the kitchen. The house lacked a mudroom, but with a little Yankee ingenuity Banks installed nickel-gap wooden boards in the back hall and her signature star hooks. A fresh coat of taupe paint on the walls freshened it up. A white dressing table with Louis Ghost Chair is complemented by the Carrie Lonsdale piece Port Clyde which lends an ethereal quality to the room. The owners’ bedroom was designed to be a peaceful retreat, a “womb-like” setting, according to Banks. The bedroom faces the street, so Banks chose white wooden blinds and linen curtains, which together create a quiet, serene space when closed. 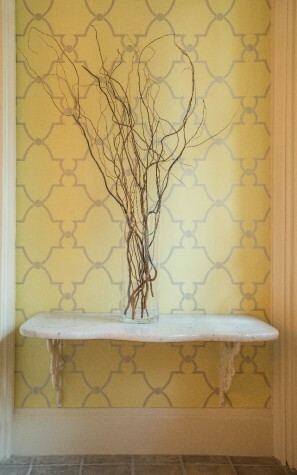 For the entry vestibule, Banks chose a “sassy” updated lattice motif wallpaper. The background color of the paper continues as a paint color into the foyer. 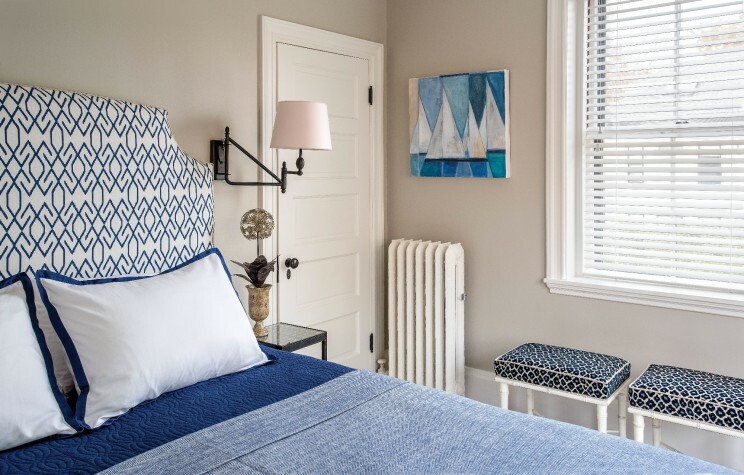 The crisp navy and white guest bedroom (above) with a Laurie Hadlock sailboat painting was designed to be “as cool as a West End harbor breeze,” says Banks. in fabric reminiscent of the wallpaper in the entry foyer. The character of the third-floor bathroom was maintained for authenticity. 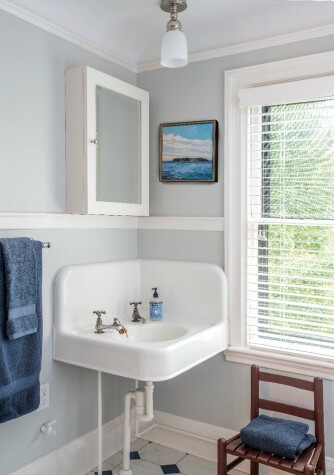 The seascape above the vintage sink is by artist Liz Armstrong. Built in 1907, the Colonial Revival is one of four town houses on a block designed by John Calvin Stevens and his son, John Howard Stevens. Unlike most duplexes, where each half is a mirror image of the other, there is little resemblance between the two homes. Surmounted by a balustrade, the broad portico is supported by Tuscan columns and covers a door flanked by sidelights. *Homeowners’ names changed at their request. When it’s time for her semi-annual buying trip, designer and Simply Home owner Linda Banks makes no promises. “I never know what I’m going to find,” she says, “and I buy only what I love.” This allows her to remain open to whatever may strike her in the moment—an item she didn’t know she had to have until she laid eyes on it. One of these “drivers,” as she calls them, can jump-start the design of an entire house. On the day before one of Banks’s trips, to High Point Market in North Carolina, longtime client Elizabeth Craven* showed up at the store asking for help with her West End home. Banks didn’t hesitate to say yes. “I loved the idea of working on a project in town, and this was a John Calvin Stevens house to boot,” she says. Just a few days later, Banks returned, triumphant with her catch: two colorful abstract paintings and a handmade Italian table that would set the tone for the project. Elizabeth and her husband, Richard*, a native Mainer, first fell in love with Portland’s West End when their children attended Waynflete School. “We have three children, two in college and one recent grad, so our challenge was finding a home that was not too big for two people but big enough for everyone to feel comfortable when they came home,” says Elizabeth. 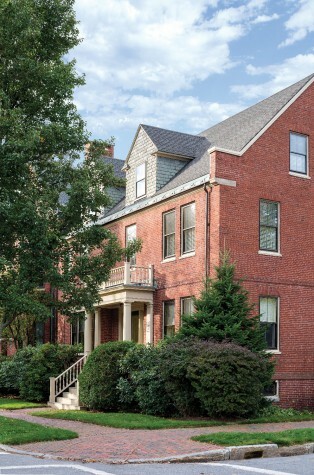 They rented in the neighborhood for several years before buying a piece of history: one of four town houses on a block designed by John Calvin Stevens and his son, John Howard Stevens. Built in 1907, the town house is part of what is said to be one of the most complicated and interesting duplexes the Stevenses ever designed. Unlike most duplexes, where each half is a mirror image of the other, aside from materials there is little resemblance between these two homes. Originally built for two sisters, the Cravens’ home is Colonial Revival while the one next door is Queen Anne. Despite its age, the home had been kept remarkably intact, retaining not only its crown molding, grand staircase, high ceilings, tall double-hung windows, and multiple fireplaces, but also its floor plan. It hadn’t fallen victim to the trend toward an open layout. “We were fortunate that the house hadn’t been botched up,” says Banks. “No one had taken apart the beautiful staircase, or tried to open up the walls.” As a result, spaces like the butler’s pantry and classic front entry hall with vestibule live on in their original glory. 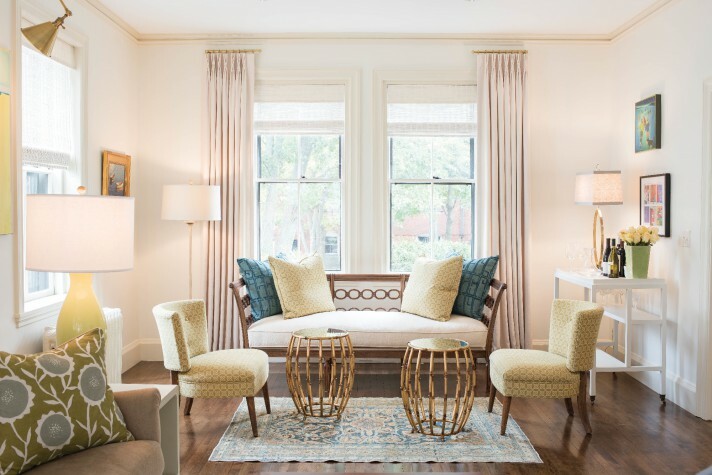 “The wonderful thing is that each of the rooms is an authentic room, classically proportioned,” says Banks. 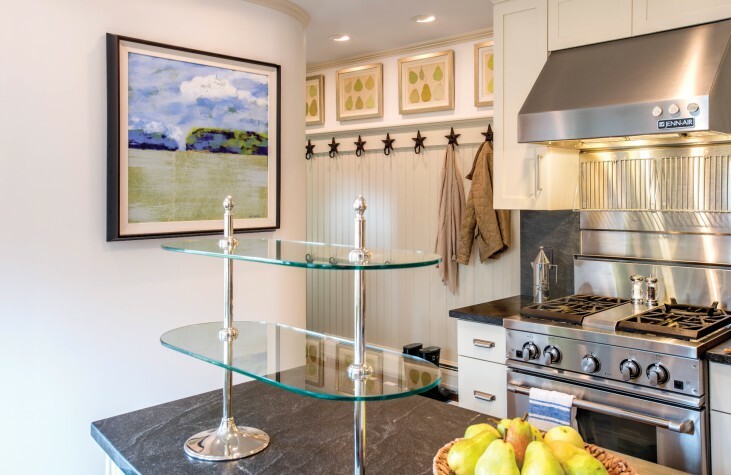 “Unlike in newer homes where we are often working with a big, open space, here we embraced the individual rooms, each one for its traditional designated use.” Discrete rooms also meant more wall space to display the Cravens’ extensive art collection. Longtime buyers of Maine art, the Cravens put highlighting their collection high on the priority list. Their artwork includes pieces by Maine artists like Mary Bourke, David Witbeck, Paul Black, Leon Anderson, Jean Jack, and Liz Hoag, as well as artists from out of state. “We have always enjoyed shopping in Maine galleries and buying primarily Maine artists. I love every piece of art in my home for different reasons,” says Elizabeth. With artwork as the anchor, Banks’s interior design began with the two Erik Knight abstracts she found on her trip. From them she extrapolated pops of color that she wove throughout the house, in the upholstery and window treatments, for example. “We created our own cohesive, neutral backdrop for the colorful artwork. Beyond that, we were aiming for a little bit of ‘mod’ without being retro. Sassy. Clean lines and a little touch of surprise,” says Banks. 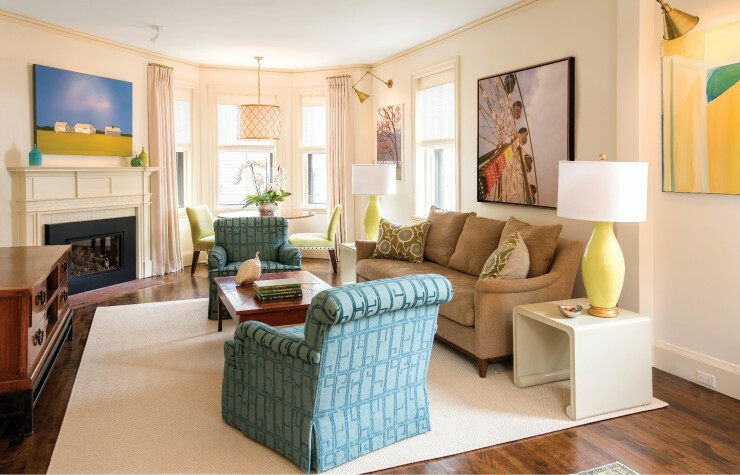 The Cravens wanted a home that would be comfortable, welcoming, sophisticated, and urban. 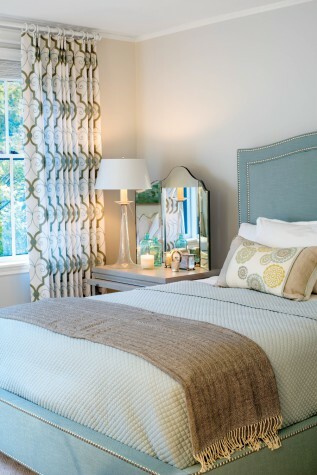 “I like my rooms to be uncluttered with simple lines, but not overly modern,” says Elizabeth. As new empty-nesters, they no longer had to be concerned with kid-friendly fabrics and rugs, which gave Banks more freedom with her selections. Upon entry into the vestibule and foyer, one is greeted by a stately, artwork-lined staircase. To the right is a spacious living room with a bay window, a fireplace, and tall, almost floor-to-ceiling windows. (As a corner unit, the home enjoys windows on three sides, a rarity for a connected town house, according to Banks.) To the left of the entry, a dining room features a glistening chandelier above a handmade Italian table and elegant wall sconces. “This room was a totally blank white plaster canvas,” says Banks. 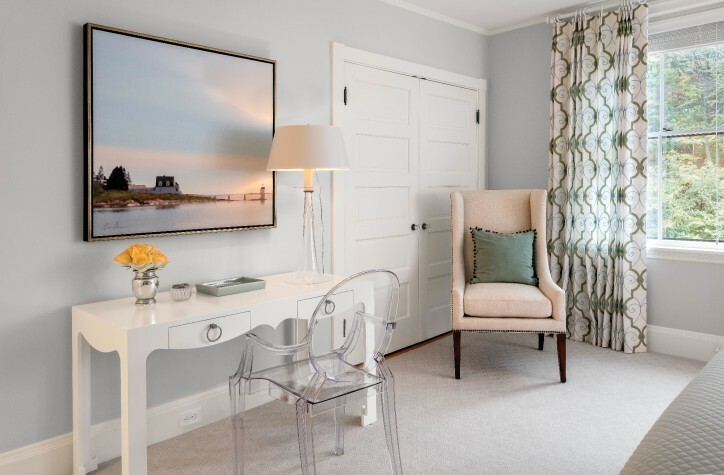 “It lacked character and also really needed a quality lighting plan.” With a little persuading, the Cravens agreed to Banks’s creating a custom-designed wainscoting that divides the height of the room. “Incorporating this architectural feature created character and integrity,” says the designer. Just beyond the dining room is the butler’s pantry with its African mahogany countertop and, beyond that, a cozy kitchen with bay window and banquette eating area. Upstairs, the owners’ suite was designed to be ethereal and serene and, with a separate bath and dressing rooms, “just for sleeping.” Across the way is a den where Elizabeth and Richard spend most evenings unwinding, “their own little in-town hotel suite,” Banks calls it. And on the third floor, the boys’ bunkroom is ready and waiting for when they come home. 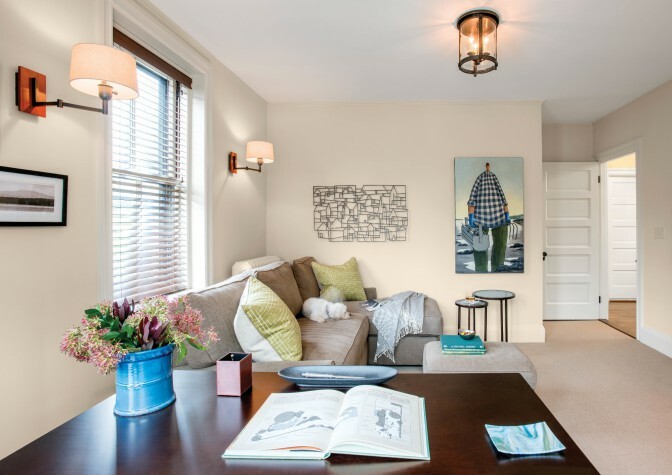 In the neighborhood where their kids grew up, the Cravens have found themselves at home within Portland’s rich architectural history as well as Maine’s vibrant art scene. “We are so fortunate to have so many talented artists with ties to Maine and the galleries that support their work,” says Elizabeth. “Very few states embrace their art community like we do in the state of Maine.” As a landscape painter and avid art collector himself, John Calvin Stevens would no doubt agree.